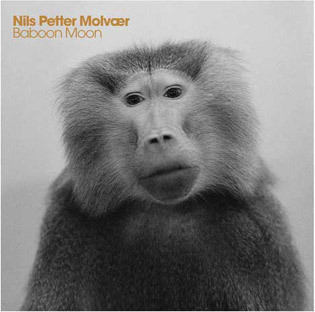 Nils Petter Molvær, Norwegian trumpet player, composer and producer, has just brought out a new CD: "Baboon Moon". Already famous for his huge success with "Khmer", an album that mixed jazz, ambient, house, electronic and break beats, he is back with a new band. We start touring at the end of September. We have about thirty concerts scheduled in Europe. Then we start again next May and then we will perform at some festivals over the summer next year. We would like to get to America, as I get a lot of mails from people saying “you have to come over here!” but there is a problem just to get the work permits. If you could just go and play that would be fine, it’s not as if we make any money! But for the moment it is a problem. How did you get started playing the trumpet? My father played the saxophone and the clarinet, but I can’t really remember who got me started as I started early, when I was about three years old. We also had one of those wind-up record players in the house and I kept playing two 78s that we had by Louis Armstrong and Billie Holliday and I think I drove my parents crazy, playing them to death and I even managed to learn how to sing “Summertime” in English before I could speak Norwegian. Did you to music school or a conservatory? I went to both. When I was in my early teens, I played the guitar and bass in bands. I went to music school when I was eighteen and then I went to the conservatory afterwards, for a couple of years. So since, 1982 I have been living from music. I really started concentrating on playing the trumpet in about 1977 because I had a really good teacher. 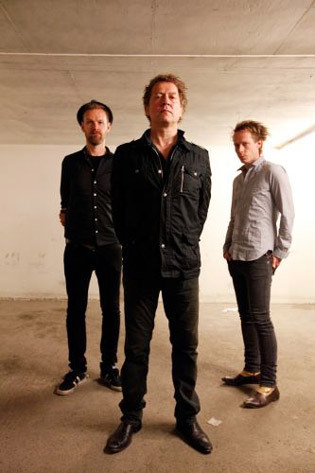 So when you moved to Oslo, was Masqualero the first band you played in? It was probably the biggest band but I played with lots of smaller bands in the late 70s. Then in about 1978 I started playing in the Jazz Punk Ensemble. When I got to Oslo, the atmosphere was very vibrant with a lot of clubs like the legendary Club Seven . I think I played in 10 bands in two months! Was Khmer your fist solo project? Yes, and it took a while to make, I made it off and on over three years while I was doing other things. I was working on the computer all the time. The whole thing was a really long process. What really got it started for me was a commission that I got from the Vossa Jazz Festival. The money gave me a chance to focus on what I was trying to do. Khmer was a huge success, it sold about 100,000 copies? Much more I think. By now it is about 200,000 copies. I was really surprised. If you had told me that we were going to sell a few thousand I would have been very very happy. When did you discover electronica? I always liked it and I had a period of playing with DJs, this is back in the early 90s, with DJ Strangefruit, who has played on some of my albums. I discovered some of the more progressive Detroit and Chicago house music back then. I have never really been a purist, I have always liked records like “Remain in Light” and “My life in a Bush of Ghosts” by Brian Eno and David Byrne. I like different things. You are also interested in Middle Eastern music and instruments like the nay and the doudouk. Yes but the nay is a very difficult instrument but I have been playing the Armenian doudouk quite a bit. I am sort of familiar with lots of instruments: guitars and keyboards and percussions. I like to be familiar with a lot of these instruments, if you are a composer it is useful to know how high the different instruments can go or what sounds they can make. I am not a great doudouk player by any means though! Then came your CD Solid Ether and also a change in recording company too. Yes, there were a lot of reasons for the change, but I like to keep control of my recordings, it seems crazy to work on these things and pretty much pay for them yourself and then give them away to a record company for life. There were also some issues about my appearing on compilations with other artists like Bjork but without even asking me. But we don’t have to go into this is detail, just to say that I wanted to keep my own masters and maintain control over my work. So I started with working with Universal but I have just now switched to Sony. Is there a Norwegian jazz scene? Yes, certainly in Oslo, it is one big family that is constantly getting bigger and bigger despite the fact that we are a small country. We work together a lot and we all know each other which makes for a very positive and lively scene even though I don’t go out much any more! There are some really fresh sounds coming out of Oslo, I would not call it “new music” because I am not sure there is such a thing but there is a lot going on. You have done a lot of film scores, is this something you still do? Yes, I am working on one right now. I enjoy the work. In the beginning people asked me because they wanted my music but I have even done some scores without the trumpet so it is becoming something new. It requires a totally different approach and you need to strive for a simplicity and precision. Sometimes your music represents the soul of the actor, or maybe you are just the energy in the landscape. I like the fact that you have to be as precise as possible. It also gives me the chance to work in a the studio and stay home! I like difference and contrast so I really like doing different things. I also like the theatre and watching good movies. Yes, I have worked on the music for The Glass Menagerie and I have just done Who is Afraid of Virginia Woolf? I have also been doing some work with this magazine that is written by people with drug problems. They are really resourceful people who just took a wrong turn in their lives at one point and got hooked on heroin and speed or whatever and they write in this magazine about their lives and they are going to make a theatre piece about this and I will be doing the music. I am really looking forward to that. 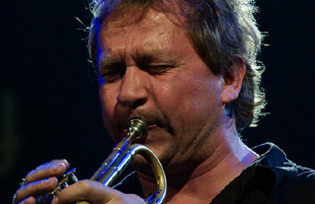 Has your composing style chnaged, do you compose with the trumpet or software? There are no rules any more, I use everything. I just like to sit by the piano and try and find things that work. But really what is more important than composing is working with the musicians that I am in thes studio with. I try and keep it all as open as possible and then work out the direction as a group with the musicians. There is a lot of interaction and sometimes it is improvised. We decide where we are going as we go along. I will bring in a few themes and then we work it out together as a group – sort of studio improvisation. My role is not to stop the creativity from happening, not to get in the way! I thought making CDs was a money loser, is touring the only way to make money? The music business has changed. I am not sure what is going to happen in the future, where the business is going. I am lucky though. I can basically work all over Europe and maybe all over the world but there is a huge difference now with the advent of streaming downloads. The record companies that have huge catalogues just put them out there via streaming and just sit on the arses and make 100,000 euros a week from that income! The artist makes next to nothing. To give you an example, the first person to have one million streaming downloads was Lady Ga GA and from that she got a tiny sum. The way it works now is that 30,000 downloads is equivalent to selling one CD. So clearly this favours the very popular and commercial artists. Is there a future in playing music? Yes, because there will always be people who want to buy CDs. But these commercial realities go in waves, things are always changing. People will always go out to listen to music and go to cultural events. Music is a very strong language, it communicated beyond words, it is very direct communication. People will always want to go out and leave their lives behind for a moment and listen to music, get absorbed in it, it is almost like a form of meditation. For example, those terrible killings in Norway recently, music was used in the memorial services as it really has the ability to move people and touch them. Music will always be there, there is a need for it. But just on a commercial level, people must realise that if they want musicians to survive, you really have to buy the CDs. If everybody keeps downloading for free then sooner or later the music scene will die. Only the very commercial stuff will survive.